MOSHIMOSHI NIPPON Ep. 14 | jibtv.com | Japan International Broadcasting Inc.
Today’s keyword is "S" for Sento's wall painter. Sento (Public bath) is an important part of Japanese culture. Many bathhouses feature paintings on the wall that are inspired by Japanese scenery. Currently, there are only three painters who can create those intricate art pieces in Japan. Mizuki Tanaka is among the youngest painters. It was when Mizuki visited a sento during her university years that inspired her to become a sento wall painter. In this segment, we talk to Mizuki who aims to gain recognition for sento wall paintings through her work. In this segment, Nakamura talks about capsule toys. 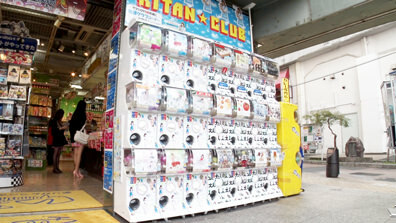 He says that capsule toys have evolved over the years and new ones inspired by Japanese pop culture are coming out. One of the most talked-about capsule toy series is the one called "Cup no Fuchico", which features office uniform-clad girl, Fuchico. The sight of Fuchico sitting on the rim of a cup is somehow charming and has attracted many toy lovers. Explore the world of fun-filled capsule toys!